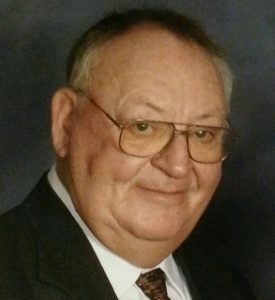 Donald Ray “Don” Swafford, age 79, of Campbellsville, died on Sunday, September 19, 2018 at his home after an extended illness. Donald was born in Taylor County on May 12, 1939, the son of the late Paul Albert and Dollie Kearny Swafford. He loved camping, dirt track racing and spending time with his family, especially his grandsons. He was a sign artist and was the owner of Swafford Sign Company, a member of the Greensburg Masonic Lodge #54 and a Kentucky Colonel. He had made a profession of faith in Christ and was a member of Robinson Creek Baptist Church. Besides his parents, he was preceded in death by two of his siblings, Rural Clyde Swafford and Wanda Shephard. Donald married Norma Jean Berry Swafford on May 15, 1959, who survives. To this union were born two children who also survive, a son Walter Ray Swafford and his wife Wanda and a daughter Donna Jean Swafford both of Campbellsville. Also surviving are three grandsons, Chase Swafford, Spencer Swafford and Reece Swafford of Campbellsville, three brothers, William Swafford of Campbellsville, Jimmy Swafford of Winchester, Albert Swafford of Tennessee and special friend John Gill of Mitchell Indiana, as well as a host of other relatives and friends. The funeral service for Donald Ray “Don” Swafford will be on Thursday, September 20, 2018 at 11:00 a.m. at Robinson Creek Baptist Church with Bro. Jim Collison and Bro. Brian Rafferty officiating. Burial will follow in Greensburg Cemetery with casket bearers being Billy DeSpain, Jason Ford, Tommy Hughes, John Gill, David Raikes, David Young, Shorty Newton and Gerald Newton. Visitation will be held from 4:00 p.m. to 8:00 p.m. on Wednesday, September 19, 2018 and 8:00 a.m. to 11:00 a.m., Thursday, September 20, 2018 at Robinson Creek Baptist Church. Memorial Contributions are suggested to be Gideon Bibles and may be made at Robinson Creek Baptist Church.